Hydroponics is a unique method of growing plants without soil. All of the nutrients that a plant needs are usually supplied through specially mixed aqueous solutions, with or without the use of neutral mediums like clay pellets, rice hulls, pumice, wool, and wood fiber. The etymology of “hydroponics” comes from the Greek words “hydro” (water) and “ponos” (labor). The term was coined in 1937 by William Frederick Gericke, a researcher at the University of California at Berkeley who pioneered the use of hydroponics for crop production. Gericke became known for growing tomato vines that were over twenty-five feet tall using water-based solutions mixed with organic nutrients instead of soil. His works were monumental in introducing hydroponics to the public view. 1. Plants can be grown wherever and whenever you want. Plants will grow as long as they receive the proper amount of nutrition and light. 2. There’s no more need for pesticides, insecticides and other chemicals. Since plant diseases and parasites are mostly soil-borne, the risk of damaged plants will be greatly lessened through hydroponics. 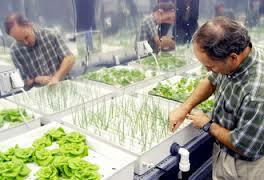 Studies have shown that plants grown in hydroponics systems grow two times faster than their soil-based counterparts. Yield is also much larger; hydroponics can be a very cost-effective measure for growing plants and crops in cramped spaces like apartments and condominiums. 4. Hydroponics can help conserve water. Due to the high amounts of nitrogen, potassium and phosphorous that it contains, agricultural run-off from soil based crops can be debilitating to the ecosystem. This is not the case with hydroponics. The water used in hydroponics systems can be reused multiple times while the plants use up all the nutrients that were dissolved in it. 5. Hydroponics require less work. No more weeding, tilling, and fumigation. Most hydroponics systems work on their own using timers and automated pumps. Upkeep is minimal. Step One: Determine the kind of hydroponics system that you will use. There are different kinds of hydroponics systems and each has its own pros and cons. For example, the water culture is relatively inexpensive to build and easy to maintain, but it is not suited for larger plants. Other examples of systems are: wick system, ebb and flow, recovery and/or non-recovery drip systems, nutrient film technique and aeroponics. Be sure to choose the right system for the plants that you are growing. Knowing your plants’ nutritional requirements is a must. This will help you prepare the right combination of hydroponics nutrients to use in solutions. Different plants have different nutritional requirements. A necessary nutrient for one plant may prove to be detrimental to another. The water used in hydroponics needs to be changed on a regular basis as all the nutrients are used up. Also, proper lighting must be maintained to ensure the optimal growth of plants. Although the C02 generators require planning and careful use, they are a much less expensive C02 source than the compressed C02 tanks. Growers can take advantage of our naturally clean natural gas, which contains low levels of sulphur- growers in eastern North America have to contend with natural gas containing high sulphur levels, which can be harmful to the garden. If crops are responding to C02applications well, consider using applications of "Growth Plus" and increasing nutrient strength gradually to take full advantage of excellent growing conditions. Q: How many hours should the grow light be on? A: The indoor garden rule of thumb is 18 hours on 6 hours off for vegetative growth and 12 hours on 12 hours off for flowering period. Lighting schedules are easy to keep when you use a timer set at the correct intervals. Q: What are the benefits of using a carbon filter? A: Carbon filter/fan combos are the best way to sterilize air and eliminate odors. With a carbon filter, you can either exhaust filtered air or “polish” and recirculate the air. Q: Which is a better lamp to grow with MH or HPS? A: I would recommend purchasing the MH kit, and when it comes into the bloom stage you purchase an HPS conversion lamp or a full spectrum MH lamp. If you are only going to use one type of bulb for flowering and vegetative stages the Sun Master neutral deluxe is an excellent lamp for both purposes. Q: How high should my lights be from the tops of my plants? Answer: The lamp should be 18 - 24 inches away from the tops. Use a clip fan to circulate air on the tops of your plants. This will help with the removal of heat produced by your lamp and also deliver fresh air across the undersides of your leaves which are where the plant breathes in through tiny microscopic pores called Stomata. Q: What is quicker and better, hydroponics or soil? A: Hydroponics produces much quicker growth rates and much better yields, compared to soil grown plants. Hydroponics growing systems and media offer a lot more available oxygen to the roots of the plants producing much quicker growth, and hydroponic systems also deliver water and nutrients directly to the roots of the plants, allowing the plants to put all their energy into the top growth. This is why a hydroponically grown plant, grown for the same amount of time as a soil grown plant, can be much bigger and better, with more yield. Q: Can I make highly fertilized soil for my seeds or cuttings? A: No, it's best not to use a highly fertilised soil as seedlings and cuttings will require very little nutrients to begin, plants will start to require higher nutrient levels when they are in their vegetative or flowering period. Choose a lightly fertilised soil for seeds or cuttings and when re-potting your established plants you can use a highly fertilised soil. Q: How do I know if I have hard or soft water? A: The easiest way to determine if you have hard or soft water is to look inside your kettle and see if you have any white scale inside. If you do you have white scale you are living in a hard water area. If you don't have white scale and the kettle looks fairly clean inside then you are living in a soft water area. This will help you to order the correct nutrients if you choose one that is available in a hard or soft water formula. Q: How do I know if I underfed, and what do I do? A: If plants are lacking the nutrients they require they will kick into action themselves and take the nutrients from their bottom leaves and deliver it into the top new growth that is developing, this will turn the bottom leaves a pale yellow, a sure sign that your plants are underfed. Raise the amount of nutrients you have been applying just slightly (don't overdo it) over a period of a few days and watch for signs of the yellowing to stop, this should solve the problem of under feeding your plants. Q: How do I know if I overfed and what do I do? A: The first signs you will see that you have overfed your plants will be some curling of the leaves and deformed new growth that is twisted and curled, very dark green in colour. Immediately you need to flush your plants with just plain water or you can use a flushing solution in the water if the plants are really bad. When refilling your hydroponic system or watering your soil or coco make sure to only start with a half strength nutrient solution for a few days until you can see that the new growth is looking normal again. A: Additives and boosts can be added to the water with your nutrients, and can assist plants in many ways. There are many additives and boosts available and most commonly they are designed to help a plant produce quicker growth and more yield from your fruits or flowers. There are also additives designed to assist plants internally and strengthen plant cells, helping to fight against attacks from pests or diseases. Using an additive or boost is definitely worthwhile if you wish to gain the maximum yield from your indoor garden. Q: What is the ideal temperature for my nutrient solution? A: Temperature range of 21 - 24 degrees is adequate, if you have problems with reaching this temperature you will need a nutrient solution heater to help raise and maintain the required temperature. A: Hydroponics is the science of growing plants without soil. The plants thrive on the nutrient-water solution alone. The growing medium merely acts as a support for the plants and their root systems while the solution passes freely. The growing medium, if any, is totally inert. Q: What are the advantages of hydroponics versus growing plants in soil? A: You can grow more plants per square foot in a hydroponic garden because roots are directly fed ~ therefore, there is no competition for root space. As a result, you can get higher yields per square foot, per unit of time. Your plants will grow faster because they will be getting all the nutrients they need and in the proper proportions. Their root systems stay smaller, so the plant can concentrate its energy on producing plant mass, rather than roots. Q: Isn’t hydroponic gardening complicated? A: NO! If you can follow simple directions, you can garden hydroponically. A few simple steps must be followed on a regular basis to ensure that your plants thrive. Once you get used to the routine ~ it’s a snap. Q: What plants grow best hydroponically? A: Anything can be grown hydroponically, but some plants prove to be more space efficient. Some plants we suggest are tomatoes, sweet peppers, hot chilies, lettuce, spinach, squash, eggplant, cucumbers, broccoli, beans, snow peas, strawberries, herbs and flowers of all types. Q: What about taste? How will the flavor compare to my outdoor grown, organic produce? A: Your own hydroponically grown herbs and vegetables will taste even better. This is due to the fact that the hydroponically grown plants are getting everything they need, when they need it. Don’t be fooled by “hot house” produce grown commercially. The grower’s primary concern is shipability and storage, not flavor. When you grow your own vegetables at home, you can expect nothing less than excellent results. Plus, hydroponically grown produce has the added benefit of a longer shelf life. Q: How often should I change the nutrient solution? A: Nutrient solution uptake will be determined by the type of crop being grown and how heavily they are feeding and the temperature of the grow room (the higher the temp, the more the plants will feed). It is extremely important that you have a TDS meter and a pH meter and that regular testing on the nutrient solution is carried out. -If you follow a nutrient line's feed schedule, they will typically have it based on changing out the reservoir every week. Topping off with nutrients and water is possible, just be sure to do the proper math and use your meters to prevent over or under watering. See hydroponic feeding tips for more details. View our selection of nutrients.Q: What is hydroponics? -If you follow a nutrient line's feed schedule, they will typically have it based on changing out the reservoir every week. Topping off with nutrients and water is possible, just be sure to do the proper math and use your meters to prevent over or under watering.